Leslie and Chuck Polokonis share a Valentine's Day kiss at St. Francis of Assisi Church. On Valentine's Day, many people indulge in expensive steak dinners and multiple bottles of wine, all in the name of romance. But this year, local Catholics spent the high-pressure date night in a completely different fashion: practicing abstinence. That's what happens when Ash Wednesday shares the date with Cupid's favorite holiday — something that hadn't occurred since 1945. For Catholics, Ash Wednesday kicks off Lent, a 40-day season of sacrifice and reflection along with abstaining from meat on holy days and Fridays. But parishioners at St. Francis of Assisi Church in Oakville found a way to celebrate their valentines without breaking Lenten regulations. Last night, the Oakville church served up its long-awaited fish fry fare of breaded jack salmon and cod nuggets along with romantic music, candlelight and long-stemmed roses. "We decided to do the Valentine's Day theme and just embrace it while keeping a focus on Christ," says Margaret Hunt, chair of the fish fry committee. "I think it worked out well. And we're famous for our jack salmon because we bread it ourselves; we're one of the only parishes for quite a distance that offers that." Hunt says that last night's affair was a little more crowded than the church's traditional Ash Wednesday fish fries — well over the usual 600 to 800 meals — and it's something she attributes to both the theme and the price. For just $9, adults dined on several types of fish and sides like mac and cheese, spaghetti, cole slaw and more — quite less than the $136 that the average person spends on Valentine's Day, according to a 2017 study. "This year, I've noticed a lot more older kids and a lot more couples, so I think they're really using it for their date night," Hunt says. 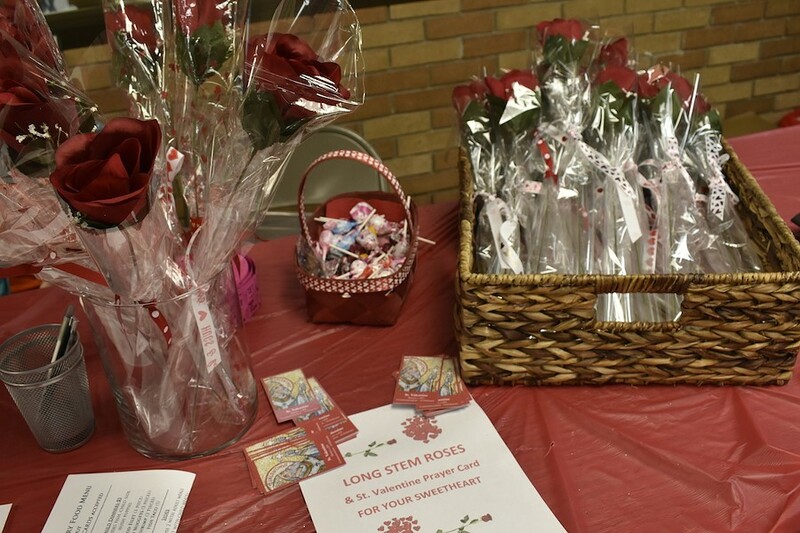 Flowers and candy add a romantic touch to the Ash Wednesday fish fry at St. Francis of Assisi. 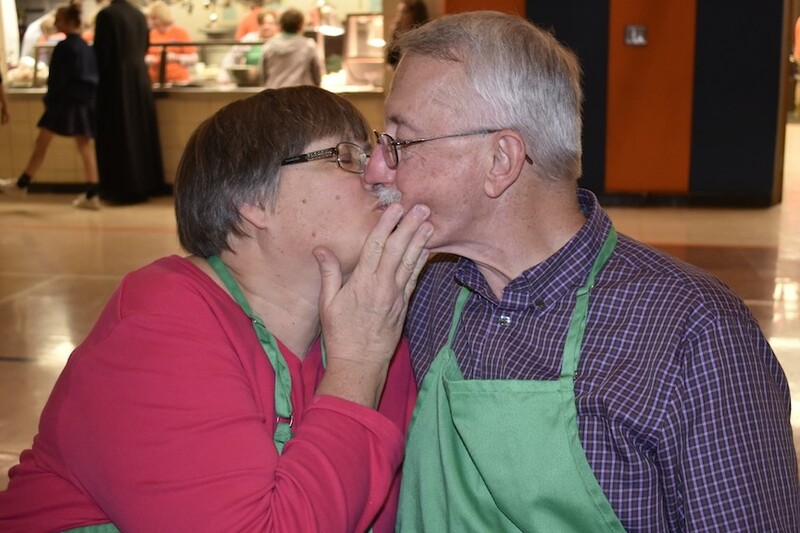 Indeed, a number of longtime couples were among the fish fry aficionados at St. Francis of Assisi. Leslie Polokonis, 60, and Chuck Polokonis, 62 of south county momentarily paused their volunteer duties to savor jack salmon and celebrate nearly 37 years of marriage — happy to eschew a fancy night out to celebrate Valentine's Day with their church family. "Especially because we're doing something for the church, but I also think it's because we're older and we have a really strong love," Leslie says of the couple's romantic evening. "And he got me flowers and candy yesterday, anyway. But Valentine's is more than a day — it's all year." "And this is a lot cheaper than going to a restaurant," Chuck laughs. St. Francis of Assisi Church will hold fish fries every Friday through March 30. For more information, visit sfastl.org.